One could argue that the first great, widespread data-based departure from tradition this century was the infield defensive shift. Based upon opponents’ batted-ball tendencies, teams more and more began to align their infielders where opposing hitters directed baseballs. And while one defensive alignment trend, infield shifts, might have peaked, another radical alignment phenomenon seems poised to be adopted more widely. Over the last decade, we’ve seen four-man outfields on a rare occasion. But I’m not sure there has ever been a defensive alignment where only one non-pitcher or non-catcher was standing on the infield dirt. Only Astros first baseman Marwin Gonzalez had his cleats in the Arlington, Texas infield skin. Now that’s extreme. That the Astros might bring us the four-man outfield as a regular strategy in meaningful games at the onset of 2018 is not much of a surprise. After all, the Astros also brought us the outfield shift last season. The outfield shift is the latest way to optimize defensive positioning, and some batters have dramatic tendencies on balls hit in the air. The Ringer’s Ben Lindbergh wrote an excellent deep-dive piece on the subject of outfield alignment last month. The four-man outfield could have some staying power. Hitters are attempting to hit the ball skyward more than ever before. The value of air balls is greater for batters. Air balls are more evenly distributed than ground balls, which are almost always concentrated to a batter’s pull side. If the next generation of positional alignment is going from four-man outfields to, even, five-man infields depending upon the batter, the labels attached to positions are really going to be challenged. The NBA has more and more become a position-less league. Maybe that’s where baseball is headed, too. For instance, the above screenshot depicts Houston’s Alex Bregman in left field. Is he actually playing left field, though? Or is he a third baseman temporarily situated in left? Should we place an F-5 in a scorebook when he catches a fly ball (which he did) or an F-7? Should we think about him more as a left-side fielder than a third baseman or left fielder? Infield shifts have already warped the way we think about, say, a 6-3 putout when the shortstop is to the right of second base, or a 4-6-3 double play in the same situations. Players often aren’t so much playing positions as they are playing zones. And, now, the prospect of more radical outfield alignments, of regular four-man outfields, further threatens to challenge how we think of positions. What do we call a fourth outfielder? Do we have a left-center and a right-center fielder? Three traditionally labeled outfielders and a rover? Gallo is an obvious hitter against whom to employ a four-man outfield. Gallo led baseball in fly-ball percentage last season (54.2%) and trailed only Matt Carpenter for the lowest ground-ball percentage (27.9%). The four-man outfield worked on Opening Day. Of course, you cannot position outfielders in the stands. There are other candidates for the four-man outfield. Maybe many others. There were 20 qualified batters who hit ground balls at a rate of 35% or less often last season. They appear listed in the following chart accompanied with their directional air-ball distributions. Maybe the Astros will be employing four-man outfields against many of these hitters. 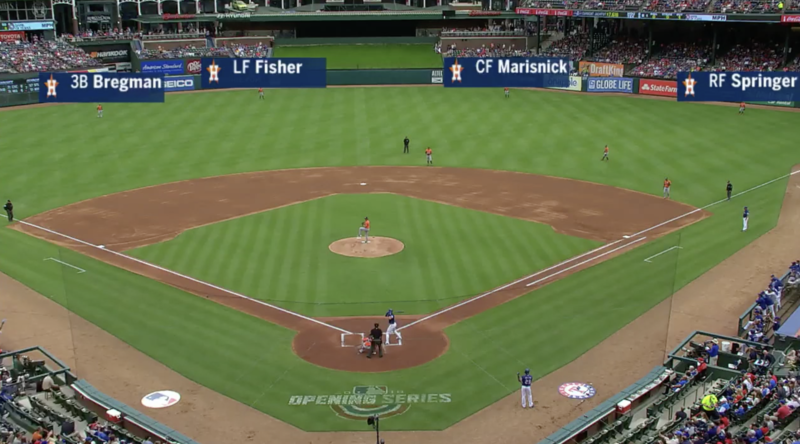 Maybe more teams will follow the Astros’ example — just as clubs followed the Brewers and Rays with infield shift usage. Outfield alignment is more complicated. Because of the different distances and hang time of air balls, aligning a four-man outfield is not as easy as creating an infield shift. Perhaps instead of essentially playing four outfielders at a similar depth, all equidistant from each other, a “rover” type position would gobble up more air balls. 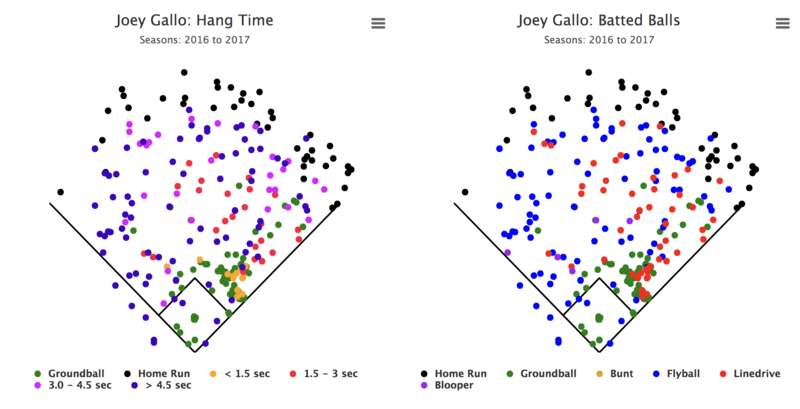 For example, Gallo hits a lot of line-drive, low-hang-time offerings to shallow center and right-center, where a fourth outfielder might be able to steal more hits. 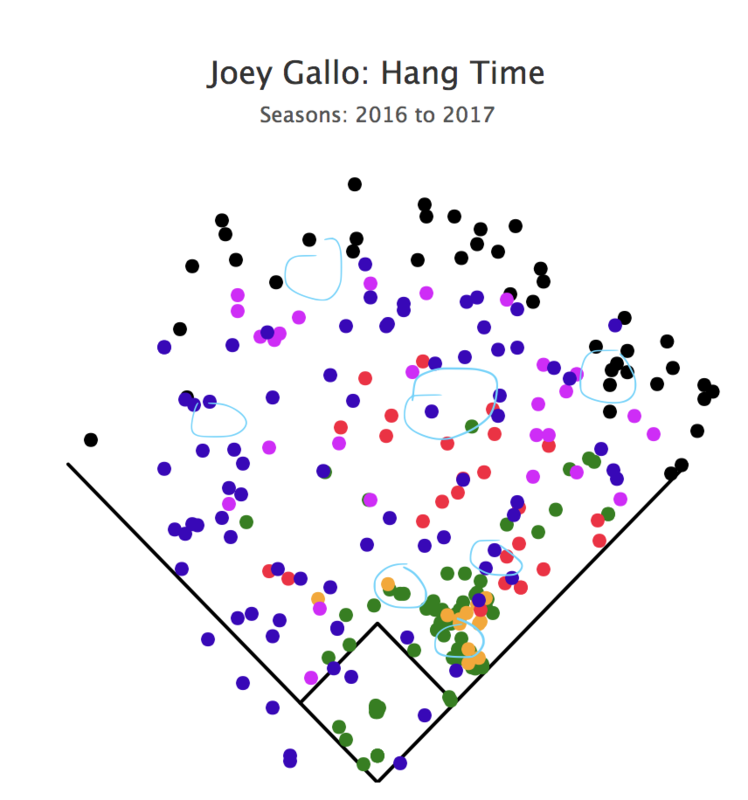 The blue circles below represent something like an ideal formation against Gallo (although I’m sure the Astros have spent more time on this than this author). Houston may or may not be on to something. Hitters could bunt for doubles against such alignment, though how many hitters like Gallo would be willing to sacrifice home-run power? What is clear is that the nature of how we define positions, how we score a game, is being challenged. We might need some new positional labels in the not-too-distant future. Fourth outfielders, rovers, might be coming to baseball. It is becoming more and more complicated for those scoring at home. We hoped you liked reading The Four-Man Outfield and Position-Less Baseball by Travis Sawchik! I continue to be astounded at the almost complete lack of bunting against the shift. Gallo could almost certainly bunt that for a double. I still think at some point guys will bunt the total shift away. The ghost of Brian McCann lives on in many. It’d be interesting to see how the math turns out. 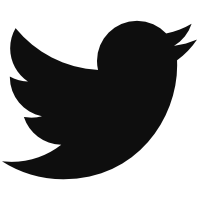 You’re trading a certain percentage of singles, doubles, triples and home runs for a different distribution of singles and doubles. But you’re also hoping that by doing so you can increase your chances of singles and doubles in the future. Even though you will certainly get a single a decent percentage of the time and the occasional double, you’re also going to have a fair amount of balls that go to the pitcher or foul balls that leave you behind in a count. You’re also completely giving up the home run ball. I don’t claim to have an answer but it’s funny how a simple decision to bunt or not bunt can have so many implications! That link talks about break even point in the comments for bunting. That just sounds like a lack of imagination. 7 of the 9 hits Gallo put into play during the Astros series were hit opposite field including one home run. So it looks like even though he is not bunting, he is adjusting for the shift.